Political-reactionist supergroup Prophets of Rage, made up of members from the former Rage Against the Machine, Cypress Hill and Public Enemy, made their sold-out live debut at Whisky A Go-Go on Sunset Strip in Los Angeles last night. True to their moniker, the group shook the stadium with anger-fueled rock, busting out hits from all three of their respective bands including Rage Against the Machine’s “Know Your Enemy,” Cypress Hill’s “Insane in the Membrane” and Public Enemy’s “Welcome to the Terrordome,” alongside original song “The Party’s Over.” Despite missing energetic frontman and lyricist Zach de la Rocha of the now-defunct RATM, participating members Chuck D and B Real paid homage to the rock-tivist’s work in the performance last night, belting out cult favorites like “Testify” and “Killing in the Name” with de la Rocha’s trademark passion. The collective has confirmed that their formation is a direct response to the turbulent events of this past election year—particularly, it seems, to singular Republican party hopeful Donald Trump’s apparently inevitable nomination as presidential candidate in 2016’s election. 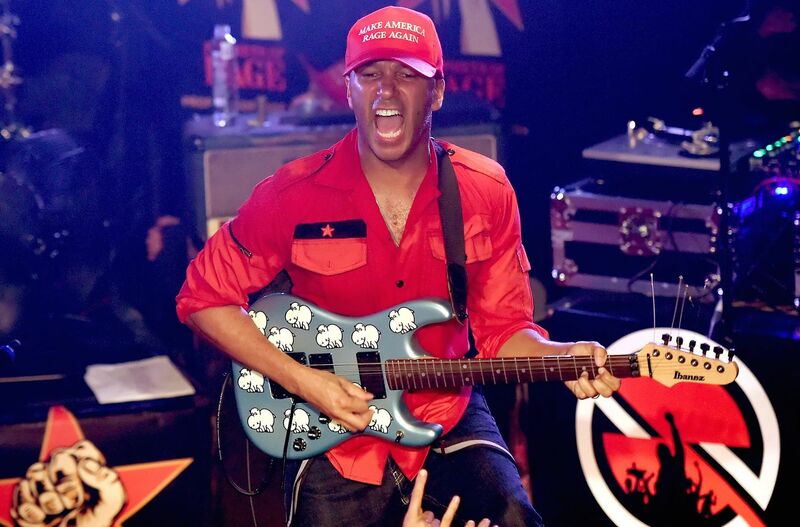 The band promoted their premiere show last night with the hashtag #MakeAmericaRageAgain, a not-too-subtle mockery of the infamous businessman-turned-politician’s campaign slogan “Make America Great Again.” Tom Morello, guitarist for both RATM and Prophets, even wore a baseball cap bearing the parody phrase, making the group’s political opinions crystal clear even before newly debuted rager “The Party’s Over” was dedicated to Trump. Proceeds from the performance are going to PATH, a multi-city charitable organization dedicated to ending homelessness. Prophets of Rage are set to make another appearance this Friday at The Palladium in Hollywood. Check out the setlist below, as well as some footage of the inaugural performance.